This student submission comes from my former student Daniel Adkins. 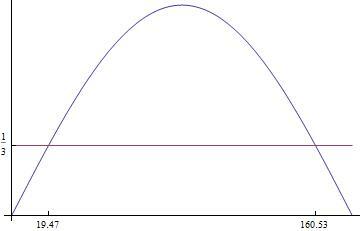 His topic, from Precalculus: deriving the double angle formulas for sine, cosine, and tangent. How does this topic extend what your students should have already learned? A major factor that simplifies deriving the double angle formulas is recalling the trigonometric identities that help students “skip steps.” This is true especially for the Sum formulas, so a brief review of these formulas in any fashion would help students possibly derive the equations on their own in some cases. Listed below are the formulas that can lead directly to the double angle formulas. This leads to the next topic, an activity for students to attempt the equation on their own. I’m a firm believer that the more often a student can learn something of their own accord, the better off they are. 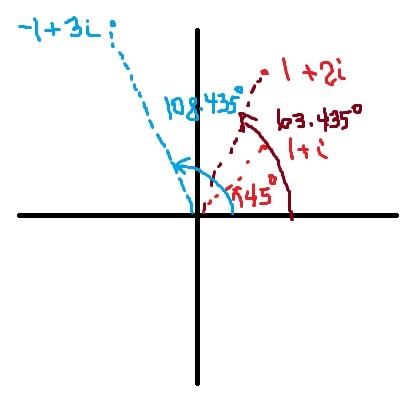 Providing the skeletal structure of the proofs for the double angle formulas of sine, cosine, and tangent might be enough to help students reach the formulas themselves. The major benefit of this is that, even though these are simple proofs, they have a lot of variance on how they may be presented to students and how “hands on” the activity can be. I have an example worksheet demonstrating this with the first two double angle formulas attached below. This is in extremely hands on format that can be given to students with the formulas needed in the top right corner and the general position where these should be inserted. If needed the instructor could take this a step further and have the different Pythagorean Identities already listed out (I.e. Cos2(a) = 1 – Sin2(a), Sin2(a) = 1 – Cos2(a)) to emphasize that different formats could be needed. This is an extreme that wouldn’t take students any time to reach the conclusions desired. Of course a lot of this information could be dropped to increase the effort needed to reach the conclusion. A major benefit with this also is that even though they’re simple, students will still feel extremely rewarded from succeeding on this paper on their own, and thus would be more intrinsically motivated towards learning trig identities. When it comes to technology in the classroom, I tend to lean more on the careful side. I know me as a person/instructor, and I know I can get carried away and make a mess of things because there was so much excitement over a new toy to play with. I also know that the technology can often detract from the actual math itself, but when it comes to trigonometry, and basically any form of geometric mathematics, it’s absolutely necessary to have a visual aid, and this is where technology excels. 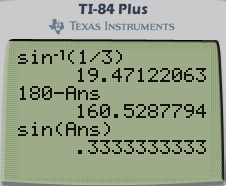 The Wolfram Company has provided hundreds of widgets for this exact purpose, and below, you’ll find one attached that demonstrates that sin(2a) appears to be equal to its identity 2cos(a)sin(a). This is clearly not a rigorous proof, but it will help students visualize how these formulas interact with each other and how they may be similar. The fact that it isn’t rigorous may even convince students to try to debunk it. If you can make a student just irritated enough that they spend a few minutes trying to find a way to show you that you’re wrong, then you’ve done your job in that you’ve convinced them to try mathematics for a purpose. After all, at the end of the day, it doesn’t matter how you begin your classroom, or how you engage your students, what matters is that they are engaged, and are willing to learn. This integral and other similar integrals are necessary to find the formula for the coefficients in a Fourier series. 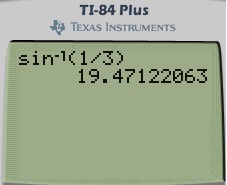 In other words, sometimes I’ll want my students to convert a product into a sum. Other times, I’ll want my students to convert a sum into a product. Some husbands try to impress their wives by lifting extremely heavy objects or other extraordinary feats of physical prowess. That will never happen in the Quintanilla household in a million years. I’ll continue with the evaluation of this integral in tomorrow’s post. Usually, the answer is no. In this series of posts, we’ve seen that a conjecture could be true for the first 40 cases or even the first cases yet not always be true. We’ve also explored the computational evidence for various unsolved problems in mathematics, noting that even this very strong computational evidence, by itself, does not provide a proof for all possible cases. However, there are plenty of examples in mathematics where it is possible to prove a theorem by first proving a special case of the theorem. For the remainder of this series, I’d like to list, in no particular order, some common theorems used in secondary mathematics which are typically proved by first proving a special case. by Lemmas 3 and 4. However, we see that what I’ve called Lemma 3, often called a cofunction identity, can be considered a special case of Theorem 2. However, this is not circular logic since the cofunction identities can be proven without appealing to Theorems 1 and 2. Notice that the red circle intersects the dashed black line at exactly one point. Therefore, we know that there will be exactly one solution for this case. We also note that the circle would have intersected the black dashed line had the dashed line been extended to the left. This will become algebraically clear in the solution below. At this point, the natural inclination of a student is to pop out the calculator and find . This is incorrect logic that, as we’ll see tomorrow, nevertheless leads to the correct conclusion. This is incorrect logic because there are two angles between and with a sine of . There is one solution in the first quadrant (the unique answer specified by arcsine), and there is another answer in the second quadrant — which is between and and hence not a permissible value of arcsine. Let me demonstrate this in three different ways. 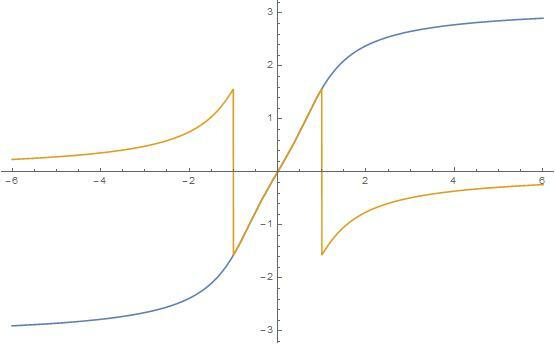 First, let’s look at the graph of (where, for convenience, the units of the axis are in degrees). 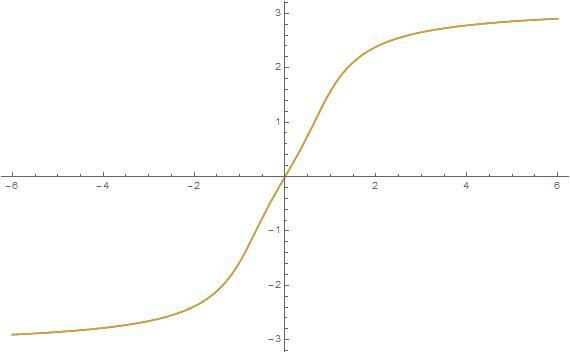 This graph intersects the line in two different places between and . This does not violate the way that arcsine was defined — arcsine was defined using the restricted domain , or in degrees. Second, let’s look at drawing angles in standard position. 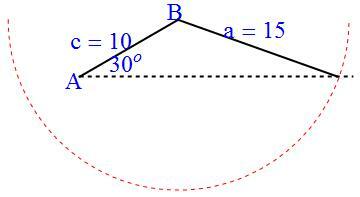 The angle in the second quadrant is clearly the reflection of the angle in the first quadrant through the axis. All this to say, blinding computing uses incorrect logic when solving this problem. 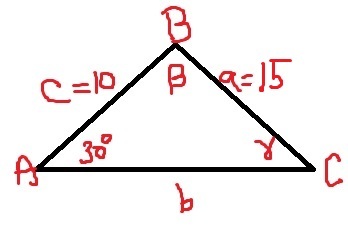 Tomorrow, we’ll examine what happens when we try to solve the triangle using these two different solutions for . There’s a shorthand notation for the right-hand side ( ) that I’ll justify later in this series. The trigonometric form of a complex number permits a geometric interpretation of multiplication, given in the following theorem. Cosine of the first times cosine of the second minus sine of the first times sine of the second… where have I seen this before? The idea is for my students to search deep into their mathematical memories until they recall the appropriate trig identity. As he couldn’t find a mistake in the student’s work, he assumed that the two expressions were equivalent. Indeed, he differentiated the student’s work to make sure it was right. But he couldn’t immediately see, using elementary reasoning, why they were equivalent. So he walked across the hall to my office to ask me if I could help. Here’s how I showed they are equivalent. Let’s evaluate the four expressions on the right-hand side. First, is clearly equal to . Also, since and , we see that . (From its definition, $\beta$ is the arcsine of a positive number and therefore must be nonnegative.) Therefore, . differ by a constant, thus showing that the two antiderivatives are equivalent.